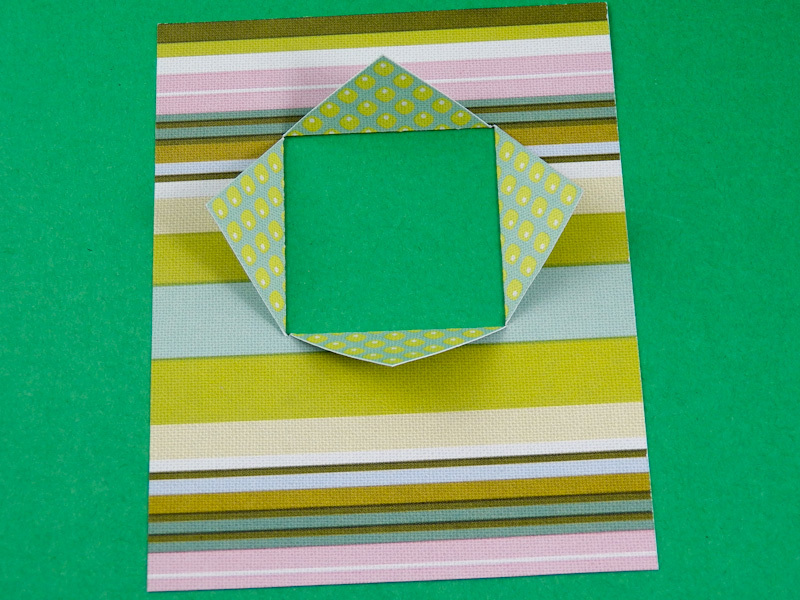 In this greeting card tutorial, see how quick and easy it is to make a window card with double-sided paper or cardstock. Just cut, fold, and glue, and then decorate with stamps and cutouts. Since the two sides of double-sided paper are meant to go together, you'll always get a color-coordinated card! 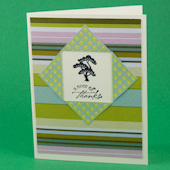 This greeting card tutorial builds on the previous tutorials in the Greeting Card Class and the Greeting Card Class 2. If you are new to card-making, review these tutorials for ideas and basic techniques. 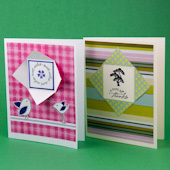 This is a Greeting Card Class 2 tutorial and is rated VERY EASY to do. For your window card you'll need a card blank, made by folding 5½″ by 8½″ cardstock in half, and a 4" by 5" piece of double-sided paper or cardstock. 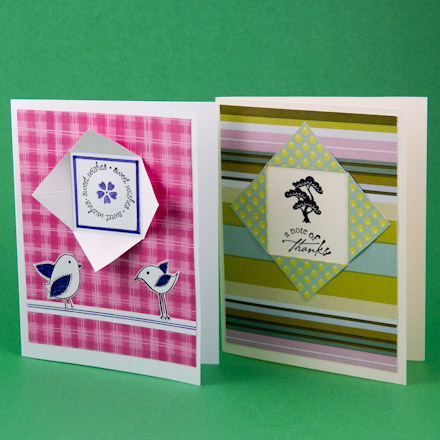 The card blank can be white or in a color that coordinates with the double-sided paper. 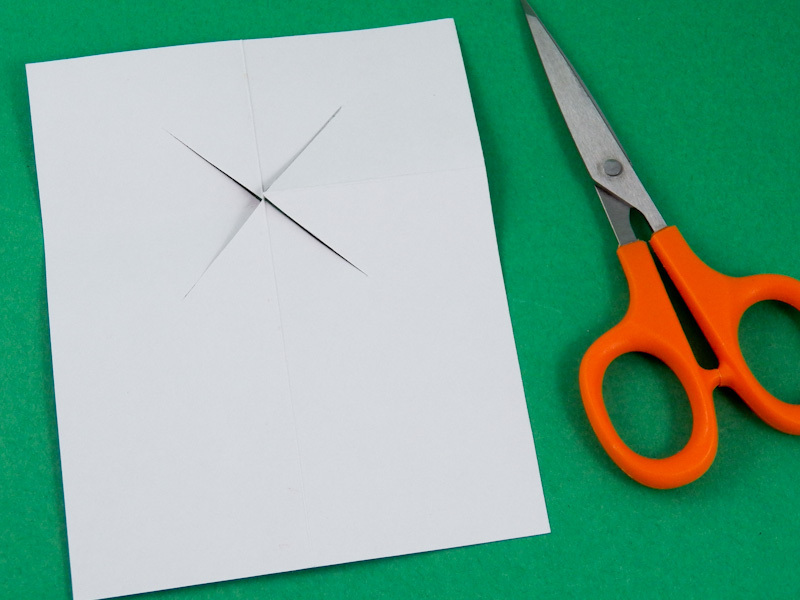 Keep any scraps of paper left over after you cut the 4" by 5" rectangle from the double-sided paper. 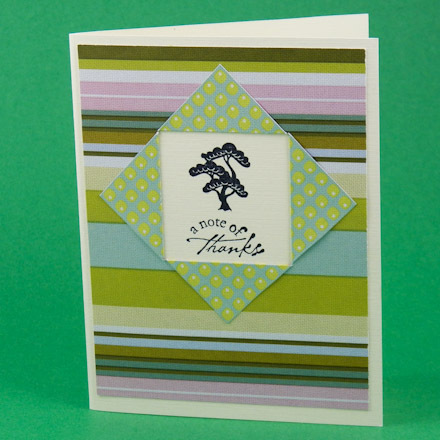 The scraps can be used to decorate the card front or insides. 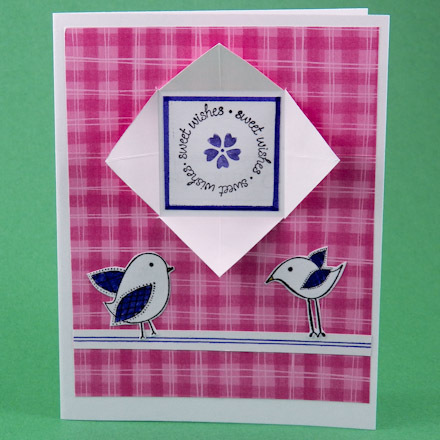 Tip: One side of the paper is the main feature of your card, while the other side creates the window frame. That is, the paper is cut and folded to reveal the paper's backside as a frame around the window. It is up to you which side of the paper is the front and which is the back. Tip: The simplest form of double-sided paper is printed on one side and white on the other side. 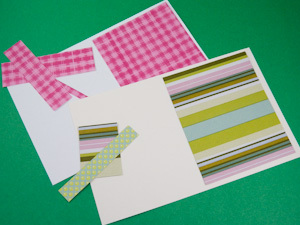 Many scrapbook papers are double-sided, with different printed patterns on both sides. 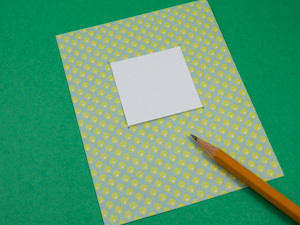 Double-sided cardstock is usually a solid color on one side and a printed pattern on the other side. All of these work well as the basis for a window card. Tip: Print ePapers on both sides of a sheet of paper to make your own double-sided paper. Check the sidebar for some suggested combinations. The card's window is a square opening that is 1½" to 1¾" in size. There are two ways the square can be cut. 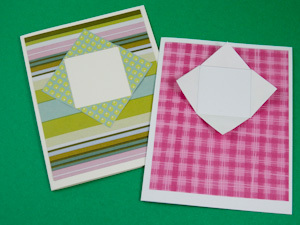 Paper can be folded and cut with scissors, while cardstock or heavy scrapbook paper needs to be cut with a craft knife. 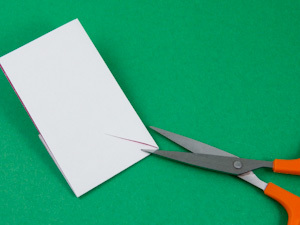 Of course, paper can also be cut using the craft knife. Before proceeding, decide which side of your double-sided paper is the front side. 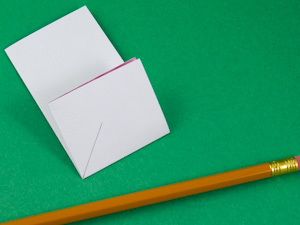 Fold the paper in half lengthwise, such that the paper's front side is inside the fold. 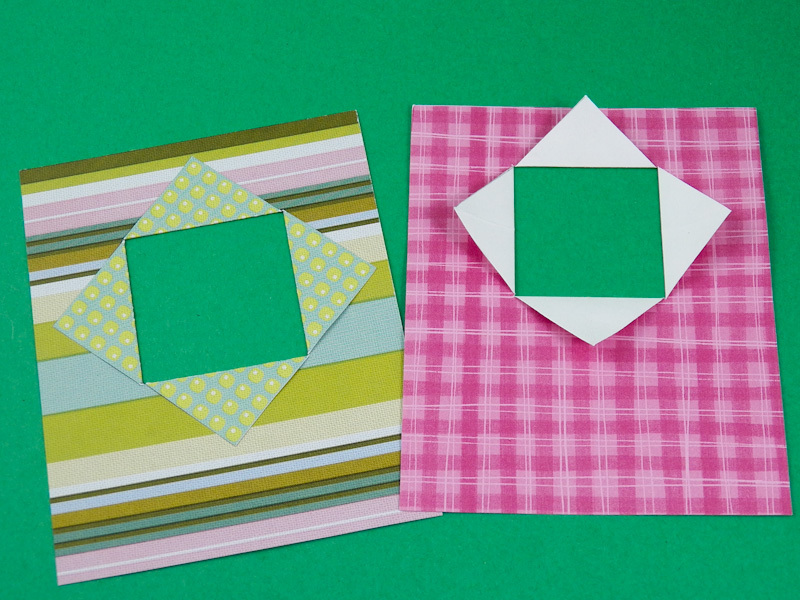 Make a second fold about 2" to 2¼" from the top. With a pencil and ruler, draw a diagonal line (45°) from the folded corner. Make the line 1" to 1¼" long. Tip: It is important that the line is at a 45° angle. Use a protractor or a quilter's ruler to get the angle correct. 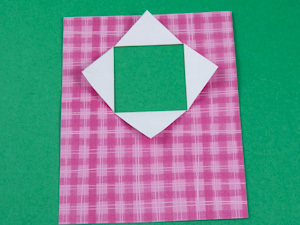 Or make your own guide by cutting a square of cardboard in half diagonally. Cut on the marked line from the corner to the end. 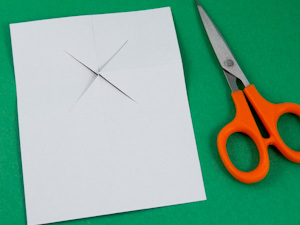 Unfold the paper to reveal an "X" cut. Smooth the fold lines. Erase the pencil mark. 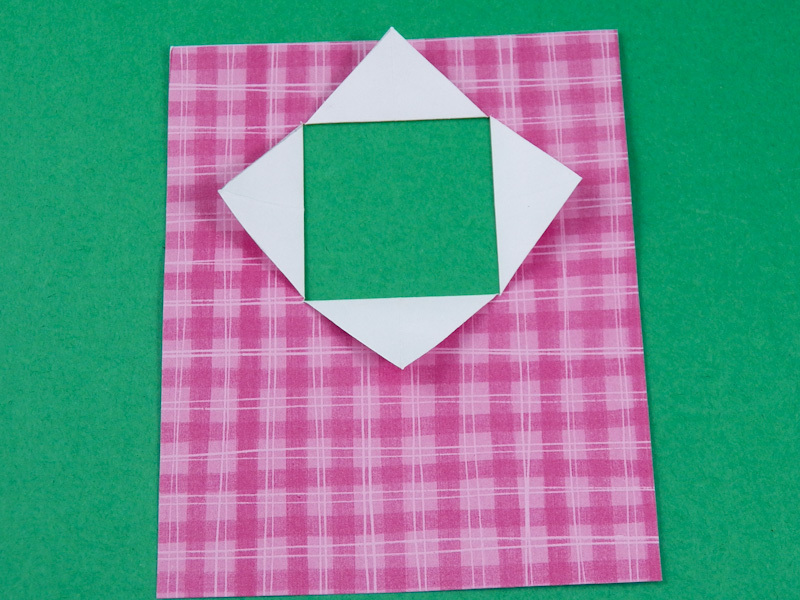 For cardstock or heavy paper, the "X" cut needs to be made with a craft knife. First, make a template for the window by cutting a 1½" to 1¾" square from cardboard. 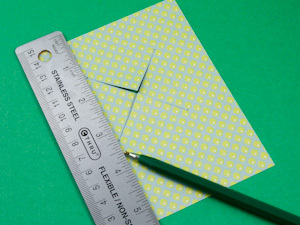 Place the template on the backside of the double-sided paper—centered and about 1¼" to 1½" from the top. Lightly mark each corner with a pencil. Use the craft knife and ruler to make two diagonal cuts using the pencil dots as guides. 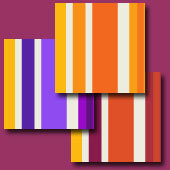 Make one cut from the upper left to lower right, and the other from the upper right to the lower left. Score the sides of the square defined by the "X" cuts. Use the ruler and an empty ballpoint pen or bone folder to score the horizontal and vertical lines that form the square defined by the pencil dots. These are the fold lines for the card's window. Turn the paper with the front side facing up. 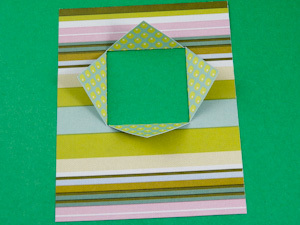 Fold back the window flaps to reveal the square window opening and the frame made by the reverse side of the paper. The window flaps can be left loose or glued down. Glue the double-sided paper with the window opening to the front of your card blank. Stamp one or two images in the window opening—add color accents with markers or colored pencils. 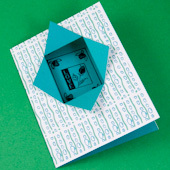 You may find it easier to stamp and decorate a square of cardstock that fits in the window opening and then glue it in place. Add more decorative elements as you like, but nothing else is really needed. Your window card is done! 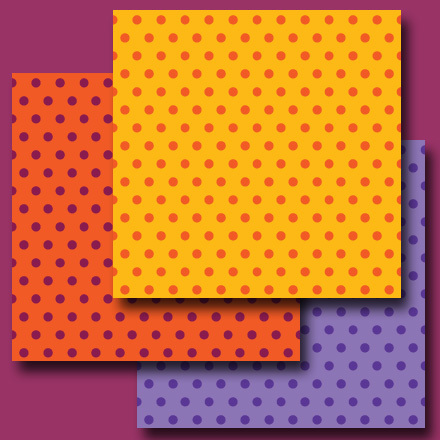 Tip: Download and print the Orange Dots on Golden, Red-violet Dots on Orange and Plum Dots on Plum ePapers. These ePapers coordinate with the Golden Stripes ePapers. 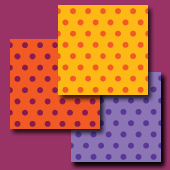 Print the polka-dot and striped digital papers back-to-back to make double-sided paper for making Window Cards. Tip: Print any of these coordinating Hawaiian Orchid ePapers back-to-back to make window cards. 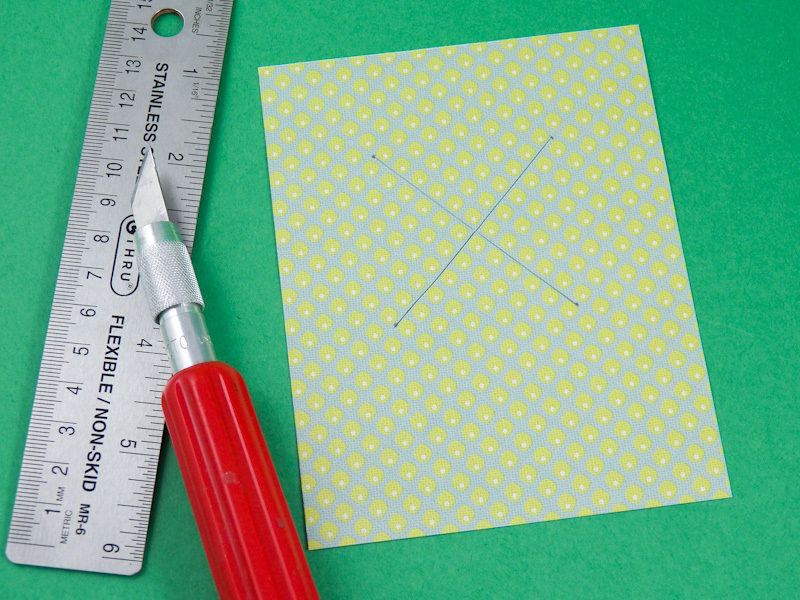 Tip: Patterned paper that is white on side and printed on the other side works well. Leave the flaps loose for one look. Tip: Glue the flaps down for another look. 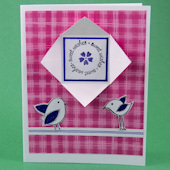 This card features double-sided scrapbook paper. Tip: A peephole or square aperture can be made in a similar way. 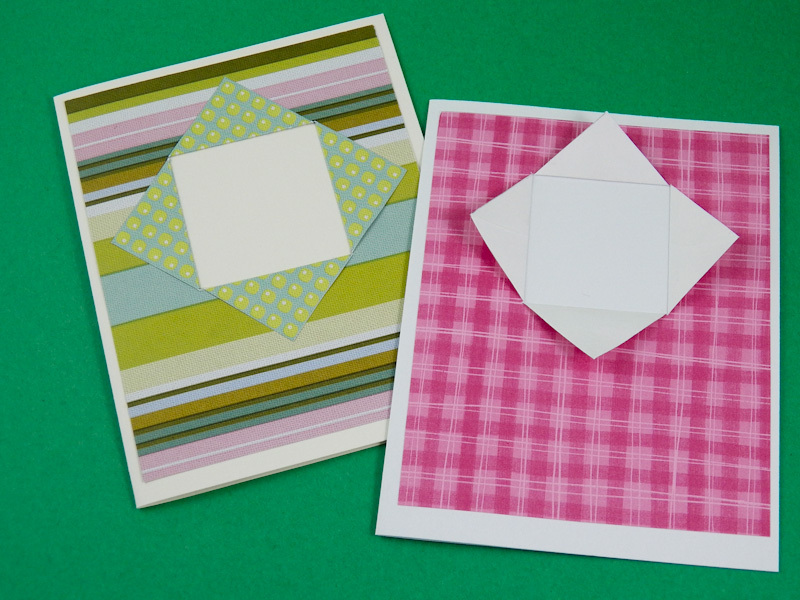 Make your card blank with double-sided cardstock, and cut the square opening in the card front. Notice that this window is a long rectangle. Cut it with a craft knife like a square window, but use a rectangular template.